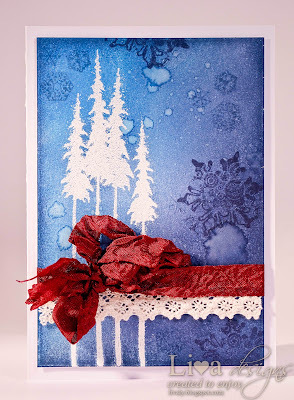 When I saw this Jennifer McGuire's card, I was so inspired, that I just had to make something similar. It really is such a simple card, but it gave me immense pleasure while I was creating it. It gave me reason to pull out my too long forgotten stamps (and my new Sizzix pine trees stamp from Holiday Joy stamp and framelits set). Applying Distress inks and stamping, then misting - well there is just something magical in the process. Pine trees itself are heat embossed with white embossing powder. 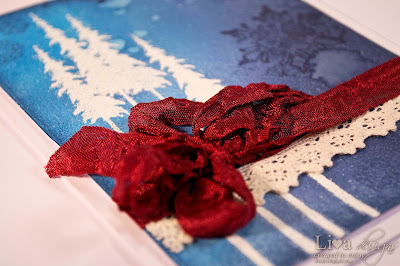 I also added that vintage lace and deep red seem binding - it turned this winter night into Christmas night. That's all to it - but I like it so much!